Peter Halley. The Schirn Ring © Schirn Kunsthalle Frankfurt, 2016, Photo: Norbert Miguletz. FRANKFURT.- From May 12 to August 21, 2016 the Schirn Kunsthalle Frankfurt is presenting the installation The Schirn Ring by the American artist Peter Halley (*1953). Halley has developed a multi-part installation, using the architecture and spatial conditions of the Rotunda and the Schirn Kunsthalle as his starting point. Halley’s installation begins in the exterior space of the Rotunda, then extends into the interior of the Schirn, employing the two ring-like galleries that surround the Rotunda as well as the adjacent exhibition space on the second floor. Across an area of some 450 m² Halley has designed an atmospheric, spatially complex, inventively coded environment that draws on both current and older elements of the artist’s oeuvre. Halley achieved notable fame in the 1980s with his Day-Glo geometric paintings that challenged previous assumptions about abstract art through his insistence that geometry is always tied to social realities. Today he is considered to be one of the most influential artists and art theorists in the United States. Since the mid-1990s he has also been creating site-specific installations for art galleries and public spaces in Europe, America, and Asia. Peter Halley’s installations are always grounded in his understanding of the cultural and architectural context of the spaces for which they are made. Thus, the development of The Schirn Ring was preceded by an intensive study of the architectural and conceptual context of the Schirn Rotunda. Halley sees the architecture of the Rotunda as loaded with cultural associations: the Rotunda’s form echoes that of the nearby historical, Neo-classical Paulskirche. At the same time, it is on axis with the adjacent Frankfurt Dom. From there, Halley went on to explore analogous elements in the architecture of the Schirn Rotunda and the design of the CERN Large Hadron Collider in Geneva. 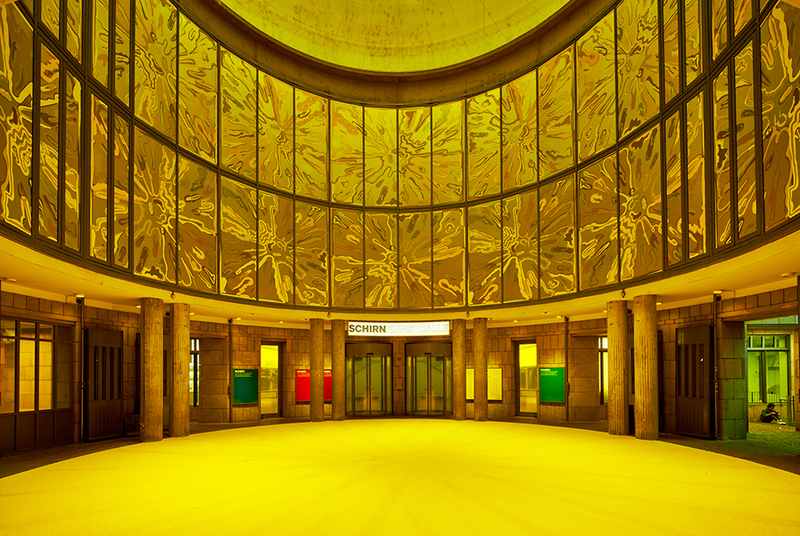 He imagined the Rotunda itself as a high-energy collider full of explosive energy bathed in yellow light. Taking up the idea of the particle accelerator, Halley charges the entire space of the Schirn Rotunda with energy. Sunlight entering from the skylight passes through a 14 meter translucent disc, filling the space with an artificial yellow light; the entire floor is painted yellow to further intensify the effect, while two floors of the Rotunda’s perimeter are clad with a grid of 3-meter-high reflective digital prints using Halley’s semi-abstract explosion images repeated 28 times in two rows. In the circular galleries surrounding the Rotunda, the artist has made two additional immersive installations. In the first floor gallery, Halley has covered the walls from floor to ceiling with a digitally printed mural illuminated only with ultraviolet black light. Rendered in delicate glowing white lines on a deep blue background, Halley has reproduced, with myriad repetitions, his computer-drawn studies for his prison paintings, transforming the wall into an endless luminous grid. Visitors follow a route around this closed circle, from which they cannot look out into the open space. Under the black light, the feeling of disorientation becomes intentionally. heightened. On the entire wall of the second floor gallery, against a yellow background, Halley presents a montage of drawings reproduced from his sketchbooks of the1980s (presented publicly here for the first time), mixed together with diagrams from the Large Hadron Collider and other notations taken from the particle physics. Seeing how the artist has arranged this vast amount of material over a distance of 45 meters provides a differentiated insight into Halley’s complex creative process, his specific motifs and their development. These 1980s studies serve the artist to this day not only as direct preliminary studies for his paintings but also as reference material for his digital prints, installation concepts, and theoretical essays. Halley himself imagined the overabundant notations on the walls as an imaginary code producing the explosive energy present in the rotunda itself. The Schirn Ring culminates in a final exhibition room that visitors enter through a doorway in the second floor corridor gallery. In this gallery, Halley has placed several more works from the early years of his career. His pioneering painting, Rectangular Prison with Smokestack from the year 1987, holds center stage. It is accompanied by two wall-size flowchart diagrams from the late 1990s, demonstrating Halley’s early interest in the algorithms that were beginning to dominate digital processes. Lastly, the artist has included a digital animation video of 1983, Exploding Cell. Using an early video game syntax, it depicts a narrative in which one of Halley’s cells becomes filled with red-hot gas and explodes. With this early video, Halley refers back to the theme of the Explosion that dominates the Rotunda. In so doing, he reminds us that his work has come full circle in this major installation, The Schirn Ring. The artist and cultural theorist Peter Halley has lived and worked in New York City for over 35 years. From 1996 until 2005 he was the publisher of index, a magazine which presented the city’s diverse cultural scene. Halley’s studio became a meeting place for artists, authors, photographers and creative people from a variety of spheres. He was director of the MFA painting program at the Yale University School of Art from 2002 to 2011. Halley studied History of Art at Yale, where he graduated in 1975, and Fine Arts at the University of New Orleans, graduating in 1978. During the 1980s he lived in New York City’s East Village, which was, at that time, the center of artistic activity for a new generation. Fascinated by the geometrisation of social and public space, the artist began making paintings that utilized elements of geometric abstraction to create an iconography of prisons, cells, and conduits. Studying the urban topography, the architecture, the façades, traffic routes, and streets of New York City, Halley combined the results of his observations with his interest in the geometric abstraction of the twentieth century. Halley’s first New York show took place in 1985 in the innovative East Village gallery, International with Monument, which was directed by artist Meyer Vaisman. At the time, the gallery also represented Ashley Bickerton, Sarah Charlesworth, Jeff Koons, Sherrie Levine, and Richard Prince. In 1987, Halley, along with Bickerton, Koons, and Vaisman, now identified with the movement variously called “Neo-Geo” and “Neo-Conceptualism,” began exhibiting at the Sonnabend Gallery, which subsequently introduced the work of these artists to a wide international audience. Alone among the Neo-Conceptual artists, Halley’s work focused on the history of geometric abstraction, which he viewed as symptomatic of the rapid spread of isolating regimented spaces, such as apartment and office blocks, hospitals, and schools, in the twentieth century. In response, Halley decided to redeploy geometric form in his paintings for representational or diagrammatic purposes. Thereby, squares and rectangles in his paintings became prisons and cells. Halley was equally interested in the invisible technological networks that linked individuals, such as power lines, water mains, and transportation networks. He expressed this in his work by interconnecting his prisons and cells by means of rectilinear networks of what he called conduits. Halley’s fascination with such networks clearly anticipated the emergence of digital communications networks in the 1990s. Since 1980, Halley has traced the state of the social space in post-industrial society in numerous texts and essays. He was among the first American artist to become interested in the sociological theories of French Post-Structuralists, including such authors as Guy Debord, Michel Foucault, and Jean Baudrillard. In the early 1990s, Halley became an early innovator in the use of digital techniques. In particular, he was among the first artists to make use of digital printing to create wall-size murals. As early as 1983, Halley had become interested in the explosion as an allegoric element in his work. Peter Halley’s works have been presented in numerous solo and group exhibitions throughout the world. His first solo exhibition in Germany was held in the Museum Haus Esters in Krefeld in 1989. In 1992-93, a survey exhibition of his work was organized by the CAPC Musée d’Art Contemporain, Bordeaux, travelling to the FAE Musée d’Art Contemporain in Lausanne, the Museo Nacional Centro de Arte Reina Sofia in Madrid, and the Stedelijk Museum in Amsterdam. In 1998 the Museum of Modern Art in New York presented an exhibition focusing on Halley’s work in printmaking. Since 2000, in addition to his ongoing painting practice, Halley has created sitespecific permanent installations for the Daimler Benz in Stuttgart (2003), at the Dallas/Fort Worth International Airport, Texas (2005), the Gallatin School of Individualized Study at New York University (2008), among others. In Germany Peter Halley’s works were last shown in 2014 in the exhibition, Prisons, at the Friedrich Schiller University in Jena. This spring, his works are on view in galleries in Barcelona and Knokke. The Städel Museum received Peter Halley’s painting Rectangular Prison with Smokestack, 1987, as a gift from the artist in 2015. In the exhibition “Peter Halley. The Schirn Ring” it will be shown in Frankfurt for the first time. Works by Peter Halley are prestigious public collections worldwide, including the Museum of Modern Art, the Whitney Museum of American Art and the Solomon R. Guggenheim Museum in New York, as well as the Museum of Contemporary Art in Los Angeles, the Tokyo Museum of Contemporary Art, the Tate Modern in London, the Stedelijk Museum in Amsterdam, and the Museum Folkwang in Essen.